Rapid development of unmanned aerial systems (UAS) in the recent years has generated new requirements on automatic flight and survivability of the flying system, particularly due to the absence of a pilot. Adaptive control systems (ACS) promise to be capable of adapting to uncertain environmental conditions and failure cases. Therefore, this field has gained increased research interests in aviation. Still an open challenge is certifiability of these systems by the official authorities. Due to the nonlinear dynamics of ACS, classical robustness metrics such as phase and gain margins are no longer applicable. Rather, stability and robustness has to be shown by Lyapunov methods. The theorems that have been derived based on Lyapunov’s methods often lack of explicit specification of bounds on the system states, which inhibits certification. Therefore, a main contribution of the thesis is a novel formulation of the Lyapunov based theorem for ultimate boundedness, which is tailored to the needs of ACS, and provides explicit values for all relevant bounds. 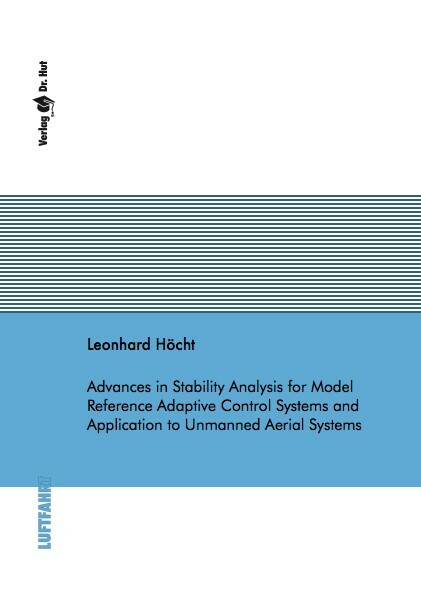 In order to prove applicability, this novel theorem is employed for stability analysis for a model reference adaptive control (MRAC) system, which is applied to a small-scale UAS. Thereby, focus is put on adaptive compensation of actuator failures, in order to increase survivability. Within the MRAC framework, two modifications to the parameter update laws are proposed, which improve adaptation performance and increase the range of uncertainties that can be compensated adaptively.